From ATMs to laptops to smartphones, a University of Maryland research group has been instrumental in making the screens that fill our lives accessible to people with a range of disabilities. Now the College of Information Studies’ Trace Research and Development Center is focusing on a new generation of interfaces ranging from immersive environments and virtual reality to gesture-based systems. Trace recently received a $4.65 million, five-year Rehabilitation Engineering Research Center (RERC) grant from the National Institute on Disability, Independent Living, and Rehabilitation Research to fund research and development of inclusive information and communication technology. “What is particularly interesting about this RERC is its focus on accessibility of the entirely new interfaces that we will be encountering in the next 20 years, and how to make them accessible to those who have disabilities, are older or have difficulty dealing with technology,” said Gregg Vanderheiden, a professor in the iSchool who leads Trace and is heading up the new research. 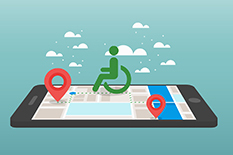 Along with co-investigators Jonathan Lazar, Hernisa Kacorri, Amanda Lazar and J. Bern Jordan, Vanderheiden will work to anticipate and overcome accessibility barriers that could arise with new technologies, as well as those still over the horizon. Moving existing accessibility advances into the lives of people with disabilities. The Trace Center has been the recipient since 1983 of Rehabilitation Engineering Research Center grants. Vanderheiden credits sustained support from National Institute on Disability, Independent Living, and Rehabilitation Research and the RERC for much of the Trace Center’s success in improving accessibility. Technologies stemming from the center’s research and development are built into Microsoft Windows, MacOS, iOS and Android, as well as airport check-in and security kiosks, automated postal stations and dozens of other computerized products, making all of them more accessible. Due to inaccurate information provided to Maryland Today, an earlier version of this article contained an erroneous grant amount, which has since been corrected. This article originally appeared in Maryland Today.